After getting to level 75 in preparation for BfA, I started to go through Northrend, then Pandaria, at an accelerated pace. 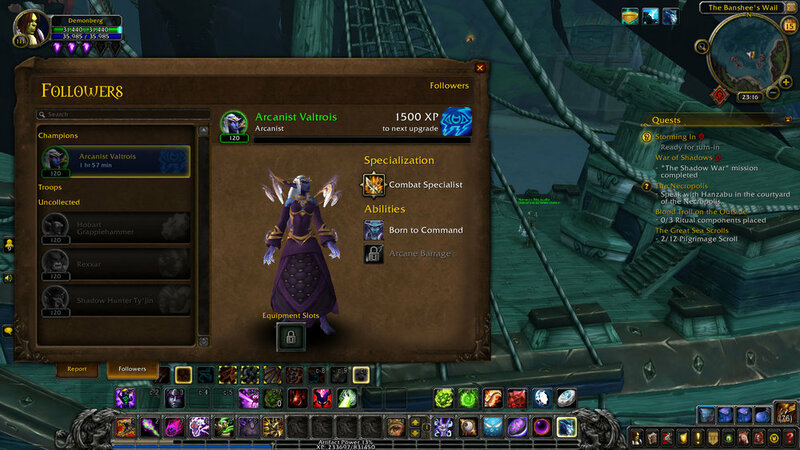 The level-scaling mechanics they’ve added a while back really helped me get to the newer expansions faster than usual, and my use of gathering professions also accelerated this process. 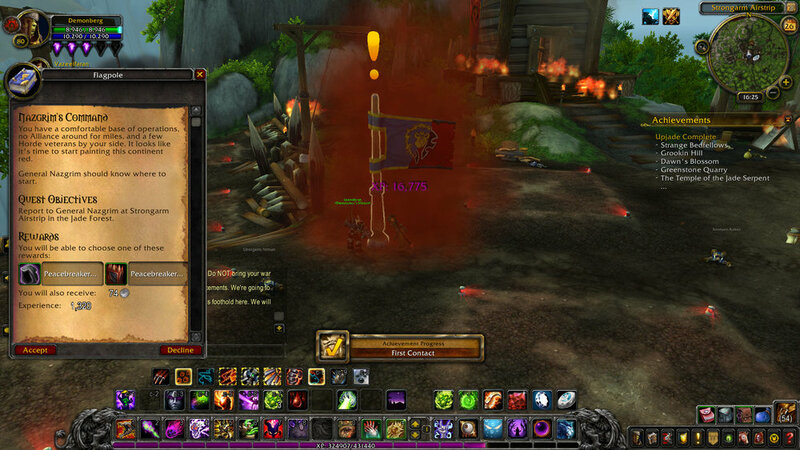 I then got to Warlords of Draenor and barely had time to do anything there; Legion was calling. I was a bit disappointed at that point that the base building from WoD didn’t carry over at all to the Class Hall feature of legion. If you consider that the whole follower system with upgrades and timers to summon more units is also in Battle for Azeroth - but you restart from scratch, it’s a bit of a triple whammy. Worse yet is that your cool artifact weapon you get into Legion is now completely useless. 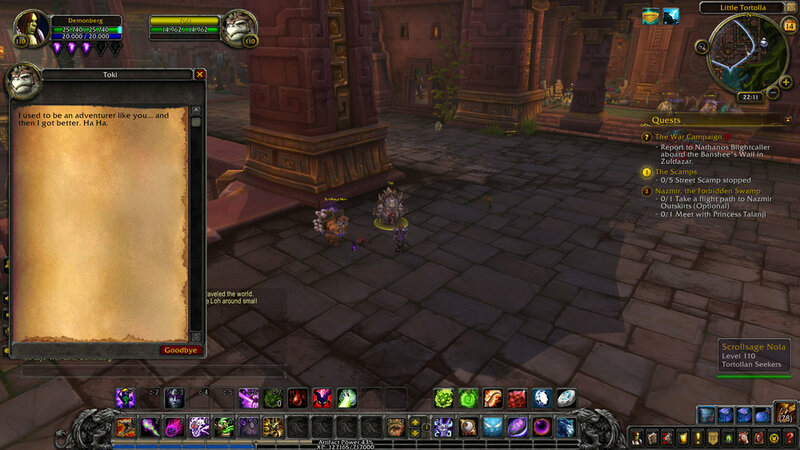 They removed all the special powers from it and you don’t collect Artifact Power from quests and items anymore. You just get nothing, The special passive abilities and active skills you had before from your artifact weapon are just gone and there is nothing to replace them. I had to go through the whole of Legion without these special features and since you stop getting new talents and skills at quite a low level, it was a bit boring. 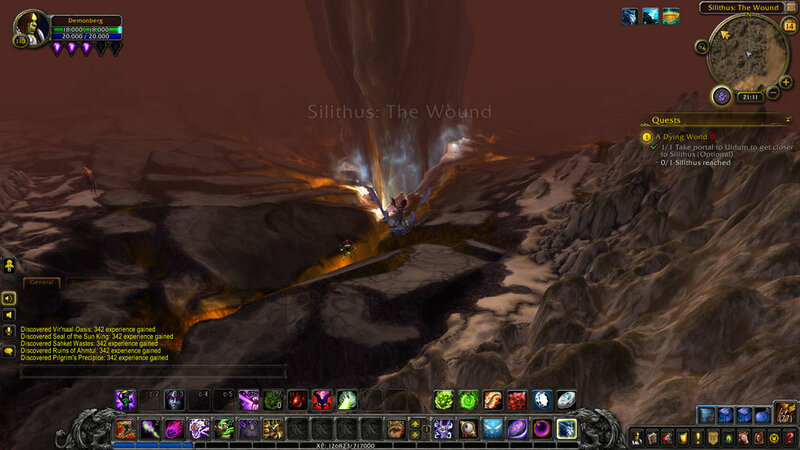 I kinda wish they would’ve left those in, at least for the time you’re doing Legion. 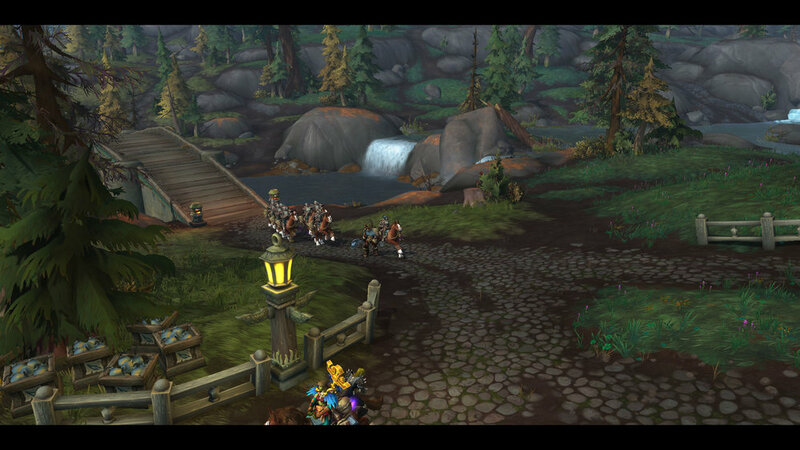 And then I got to Battle for Azeroth proper, with about a week left to spare on the game. It gets a bit more cinematic this time around and you go through a bunch of story quests before heading to Silithus to get your new gameplay mechanic item that they’ll probably get rid of in the next expansion; The Heart of Azeroth, a newfangled necklace that gets more power as you complete certain quests and lets you unlock passive abilities on certain pieces of gear you’ll collect along the way. 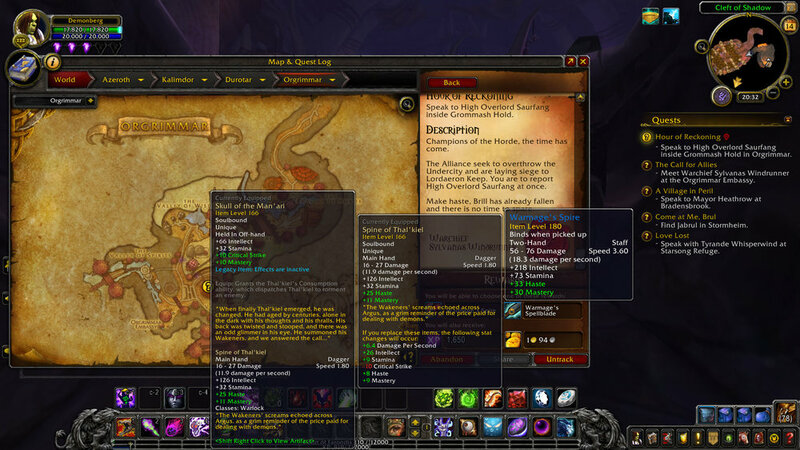 It’s an okay system, but having to choose between two pieces of gear with the same stats that go in the same gear slot with only slight variations in passive Azerite powers is kinda a boring choice. Also, like I mentioned earlier, they’ll probably scrap that whole system in the next expansion and it’ll be much more of a pain then. On the horde side, the new city of Zuldazar is an interesting Mayan-inspired pyramid that is kind of a pain to move around and you have three regions to do quests in. 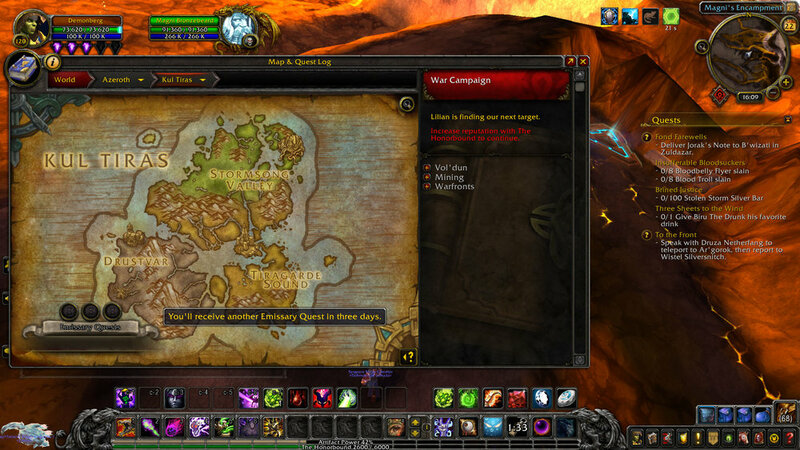 At some level intervals, you also go to explore the other faction’s continent in order to cause some mayhem. You also get to train and send followers in order to complete timed mobile-game style quests to get more reputation and loot. 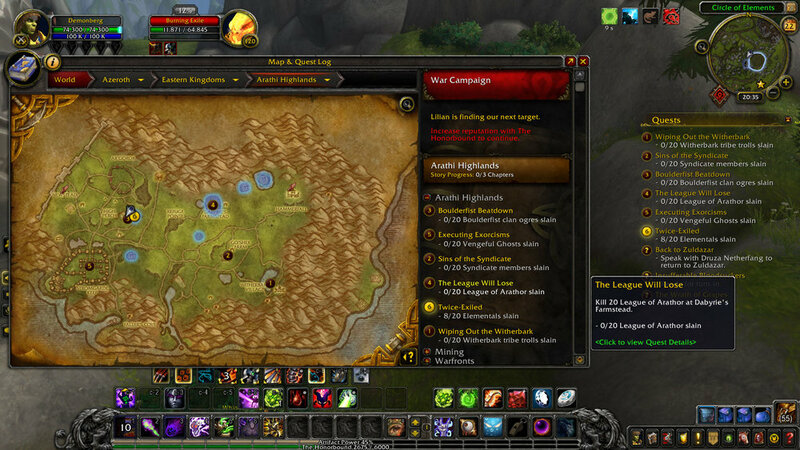 I also did a few Island Excursions where you play with other players and race to collect more Azerite than the opposing faction. It was a nice distraction, but being multiplayer it didn’t interest me. The quests aren’t too bad and the storylines are interesting enough for me to have kept playing until I hit level 120. At that point, you get World Quests which are Diablo 3-like bounties that reward you with great gear upgrades and other goodies. The big problem with them is that they are on a daily timer. You have 3 bounty spaces and you can get a new one once per day, I did everything I could do in a few hours and then had nothing else to do that interested me. There’s PVP, dungeons, raids, stuff like that, but I’m not really a fan of that kind of stuff, I kinda wish I could’ve done these World Quests forever. I couldn’t, so I stopped playing! Battle for Azeroth is not a bad expansion, I went through the whole thing and didn’t regret it. I just didn’t pay for more than one month and don’t think I’ll play this part of the game again. I’m really interested to see how they’ll do the next one and how much they’ll ruin everything all over again!